Posted December 5, 2018 by Mitch Hitch & filed under City Hub, Featured City Hub. Woolloomooloo is one of Sydney’s oldest suburbs. Subdivided in the 1840, the area’s first land grant occurred in 1793. Nicknamed the ‘Loo, it is still predominately a working class area with a considerable public housing stock. But in recent years the suburb has witnessed a boom in upmarket dining along the Finger Wharf and many of the local hotels. Up until 1935 the area’s public transport was served by a tram to Circular Quay. In recent years the only transport option is the 311 bus which is slow and subject to peak hour grid-locked traffic conditions. “We are on the cross roads where Sydney goes north, south, east and west and we are getting caught in terrible bottle necks and this is adding to the pollution in the area and degrades the general atmosphere,” John Gerathy, co-convener of the as yet un-named association said. Last week,75 Woolloomooloo residents. business owners, restauranteurs and publicans crowed into the Woolloomooloo Bay Hotel to hear speakers propose a ferry service to their area. Speakers included member for Sydney, Alex Greenwich, manager of the soon to be built Sydney Modern, Sally Webster, hotelier Arthur Laundy and residents’ representative John Gerathy. 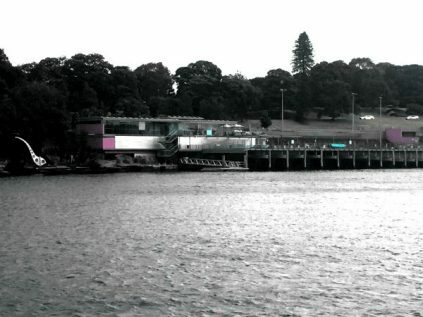 “Everybody was behind the proposal which would see residents of Greater Sydney get access to the Parramatta River or the harbour east, west, north and south, get to the Botanic Gardens, the Boy Charlton Pool, the Art Gallery of NSW and the new Sydney Modern and the Woolloomooloo precinct,” John Gerathy said. The proposal is for a ferry wharf to be built near the Boy Charlton Pool and lift installed to take passengers up to the board walk that runs along the top of the pool. “There is a body of evidence already there and it has some strong backing with the Art Gallery soon to be redeveloped. In 2013 a Government report identified either Woolloomooloo or Elizabeth Bay for a ferry wharf,” Alex Greenwich, member for Sydney said. The 2013 report which Mr Greenwich proposed failed to gain traction within government, but other failed proposals go back even further. “We won the Woolloomooloo Ideas competition in 1992 and we had a ferry wharf so this is an idea that is been overdue for decades,” Councillor Professor Philip Thalis, City of Sydney and practicing architect said. “The process from here is that locals are running a strong community campaign and we need to put the evidence to the Government, to the local area, the local economy and keep the pressure on to deliver,” Alex Greenwich said. “We are intending to apply pressure on Gladys, she’s there until March, and I will be putting pressure on Michael Daley as well,” John Gerathy said. In Woolloomooloo it is safe to say local residents and business owners know more about the subject than the government authority.